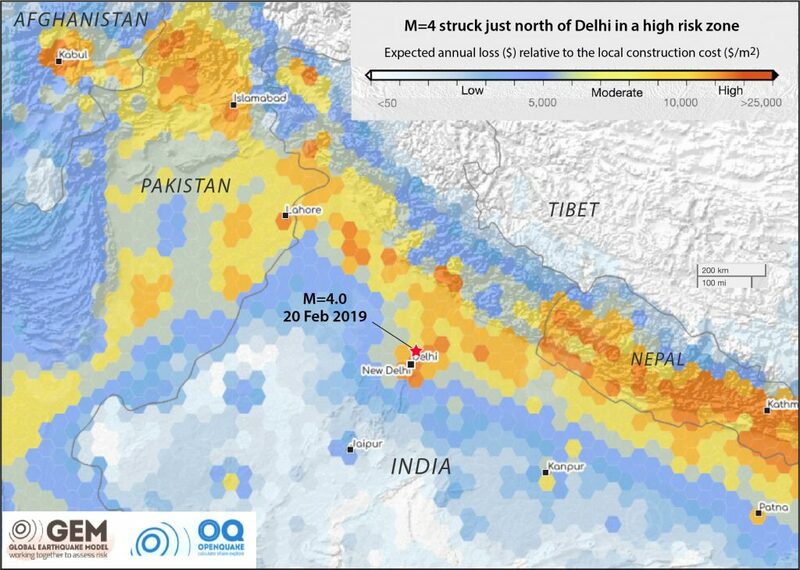 Ross Stein, Ph.D., Temblor, Inc.
On 20 February 2019, a magnitude 4 earthquake struck 50 km (30 mi) north from the megacity, Delhi. A magnitude 4 earthquake is not large. If it occurs nearby, it can be felt, and may generate some damage, but it is almost never fatal. 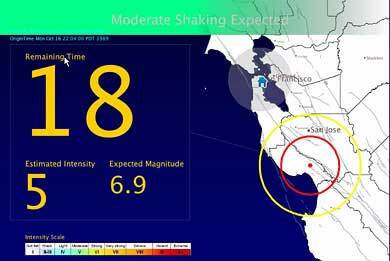 This earthquake was no exception: shaking has been reported to be weak to moderate. So, what is interesting about it? Actually, there is a lot to be learned from small, seemingly unimportant events like this. Let us use this earthquake as a means to explore the seismic risk in India. This portion of a new map from the GEM Foundation shows the expected cost of earthquake damage relative to the cost of construction, averaged over time, everywhere on Earth. The Himalayan Foothill Thrust region lights up in a band of yellow-orange high risk. 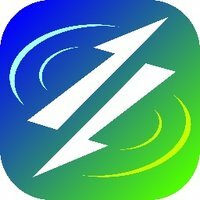 The risk is the product of a very high seismic hazard and an extremely high population density. Pakistan and Nepal are also seen to be at very high risk, followed by greater Kabul in Afghanistan. We know from GPS observations that the Indian plate is moving 16-18 millimeters per year towards the Eurasian plate (Bilham & Ambraseys, 2005). It is pushed, rather forcefully, below the Eurasian plate. This movement has resulted in the creation of the beautiful Himalayas. But it has also resulted in a thrust-zone, where many great earthquakes occur. In this zone, the two plates are interlocked most of the time. Since the plate is pushing from behind, the stress builds up until it is strong enough to overcome fault friction. Then, very large earthquakes can occur. India has been in a slow-motion crash into Asia for 40 million years, as attested to by 500 years of historical reports of great earthquakes, with events striking principally along India’s northern frontier. Some 400 million people live in the Ganges Plain (bright white area), just south of the frontier, in India and Bangladesh. Graphic by Volkan Sevilgen. At the thrust-zone between the Indian and Eurasian plate, at least three earthquakes with a magnitude larger than 8 have occurred in medieval times (Bilham, 2009). The recurrence time of this kind of earthquakes is unknown, but it is speculated that earthquakes of similar magnitude are overdue (Bilham & Ambraseys, 2005). But, if we take a closer look at last week’s earthquake, it did not occur at the thrust-zone, but further in the south. Actually, there are many earthquakes known to occur far away from the thrust-zone. This could be easily explained, if the Indian plate itself was deformed substantially. But, we know that the rate of deformation along the continent is very low, around 5 millimeters per year (Bilham, 2004). This is too low to explain frequent seismicity. The explanation is simple, yet fascinating. The downward bend of the Indian plate beneath the Himalayas has resulted in a ‘flexure’, or bending, of the plate. We can see this in the cross—section south of the thrust-zone. There is first an upward bulge of approximately 450 meters, followed by a smaller depression (Bilham, 2004). Now, we can imagine the plate to be like a wooden stick: it bends before it breaks. In this cross-section, North is to the right, and South to the left. The buckling of the Indian plate leads to a bulge south of Delhi, along with shallow tensional quakes, as struck last week. The great earthquakes strike along the thrust fault at right (purple), as well as other sites of concentrated buckling (Bilham, 2009). The first part that breaks is usually a weak spot. In tectonic plates such weak spots are often faults, planes where the rock has failed previously due to an earthquake. Weak planes, that were previously stable, will be pushed towards the thrust-zone, and move through the bulge, where the change of flexural stresses can trigger failure and consequently earthquakes. Now we can put the picture together: Seismic risk in India can be attributed to earthquakes at the thrust-zone below the Himalayas, and to seismicity within the continent due to flexural stresses. Delhi, as an example of a vulnerable metropolis, has a history of being affected by both (Iyengar, 2000). There are around 20 seismically active faults in the vicinity of Delhi capable of generating earthquakes. The Mahendraghar–Dehradhun fault, for instance, could produce an earthquake of magnitude 7 (Iyengar & Gosh, 2004). One problem is, that the fast urbanization in Delhi is leading to a rising number of buildings that are helpless even in the face of moderate sized earthquakes (Mittal et. al., 2012). India is one of the countries with the most earthquake-related deaths. 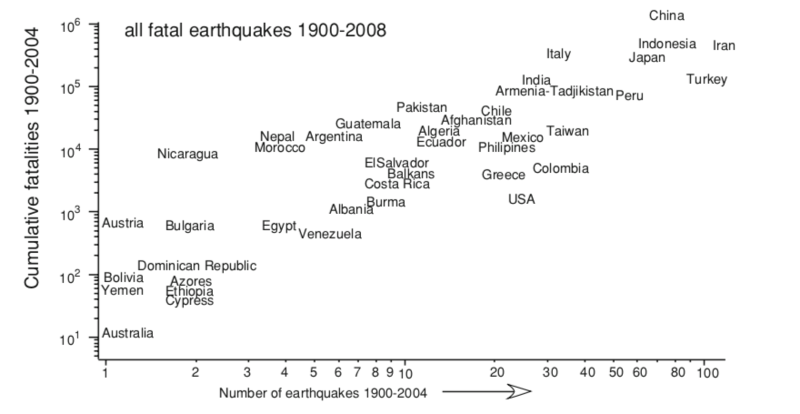 Just in the past century, over 100.000 people have died due to earthquakes in the country (Bilham, 2009). This number is unlikely to decrease in the future: Its population is growing, and the consequential increase of fatalities is foreseeable (Bilham, 2009). In their hazard assessment, Nath and Thingbaijam (2012) conclude that the Bureau of Indian Standards underestimates the seismic risk in India and recommend updating the National Building Code. But there is another problem. According to Bilham (2009), constructers often ignore existing building codes. Among the reasons he lists are ignorance of the seismic risk and the engineering solutions to it, people trying to save money, and corruption. He suggests that this could be solved by education. If everybody knew about the fatal consequences of not including earthquake resistant structures, it would occur less frequently. Often, action is only taken after the disaster, but that is too late for many. So, this comparatively small earthquake near the megacity should be a reminder to put more effort to raise awareness of the earthquake risk. Bilham, Roger. The seismic future of cities. Bulletin of Earthquake Engineering, 2009, 7. Jg., Nr. 4, S. 839. Bilham, Roger, et al. 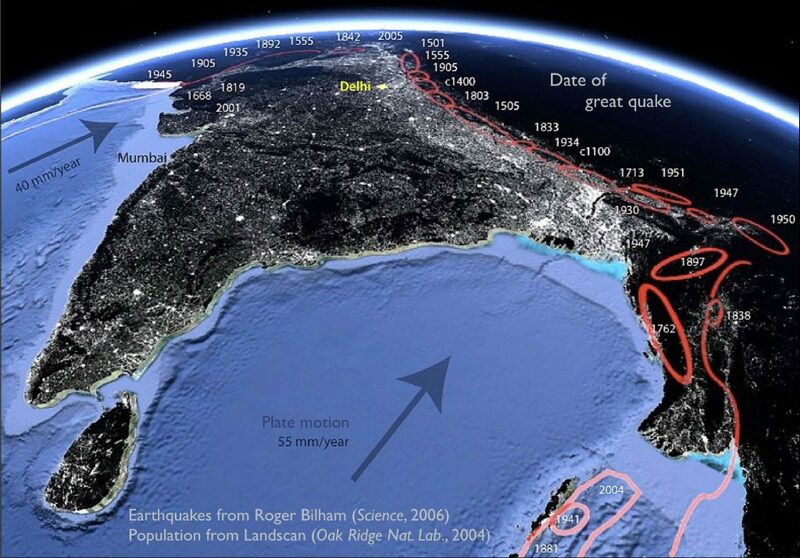 Earthquakes in India and the Himalaya: tectonics, geodesy and history. Annals of GEOPHYSICS, 2004. Bilham, Roger; AMBRASEYS, Nicholas. Apparent Himalayan slip deficit from the summation of seismic moments for Himalayan earthquakes, 1500–2000. Current science, 2005, S. 1658-1663. Iyengar, R. N. Seismic status of Delhi megacity. Current Science, 2000, 78. Jg., Nr. 5, S. 568-574. Iyengar, R. N.; GHOSH, Susanta. Microzonation of earthquake hazard in greater Delhi area. Current Science, 2004, 87. Jg., Nr. 9, S. 1193-1202. Mittal, Himanshu, et al. Stochastic finite modeling of ground motion for March 5, 2012, Mw 4.6 earthquake and scenario greater magnitude earthquake in the proximity of Delhi. Natural Hazards, 2016, 82. Jg., Nr. 2, S. 1123-1146. Nath, S. K.; Thingbaijam, K. K. S. Probabilistic seismic hazard assessment of India. Seismological Research Letters, 2012, 83. Jg., Nr. 1, S. 135-149.